I well recall landing in Dover the day after Celtic had lost to Borussia Dortmund in Germany in September 1987. The hangover I suffered from was two fold; firstly the physical kind which was a result of too much German lager; secondly there was the mental anguish of another early Celtic exit from Europe. It’s interesting to recall the aftermath of that game when hundreds of Borussia fans invaded the park and ran towards the Celtic end of the ground. Had it not been for the 20 foot high wire fence that separated them then it would have resulted in serious incident with 2000 Celtic fans boozed up to the eyeballs and ready for anything that was coming. The irony is that both sets of fans now have a wonderful relationship going back many years. Upon arriving in Dover the English newspapers reported the shock news that Celtic were in the closing stages of signing Frank McAvennie for £750,000, a Celtic club record fee. McAvennie was rated as one of the best strikers in Britain and had a wonderful spell in London with the Hammers and this was seen as a great coup for Celtic in their centenary season. 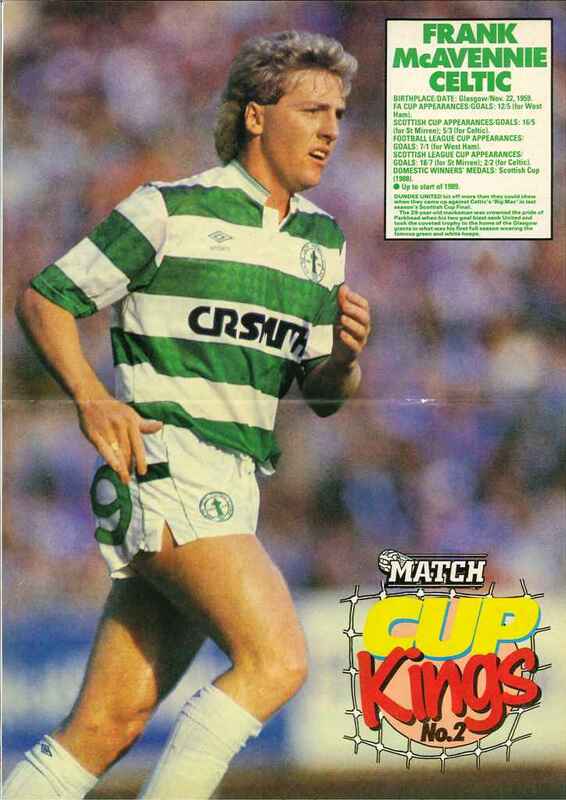 They hadn’t played badly against Dortmund but they had lacked punch up front and McAvennie was exactly the man to add that to the Celtic attack. Literally. In October 1987 during a highly charged game at Ibrox between Rangers and Celtic Frank had became embroiled in an incident with Chris Woods and Terry Butcher which resulted in all three being sent off. This was also the game when Graham Roberts famously conducted the Ibrox ‘choir’. You can imagine the headlines in the media but matters took a serious turn when the non footballing authorities got involved. It is said that an over zealous Glasgow Procurator Fiscal decided to make an example of these beastly footballers (McAvennie and those three named Rangers players or Goldilocks and the Three Bears as the press christened them) who had made a spectacle of themselves on television. Truth is that none of those players should ever have been inside a court of law. Legend has it that when the decisions where read out in court, Frank heard firstly that Butcher and Woods were guilty and Roberts was not proven. Fearing the worst he was then informed that his was a not guilty verdict and he burst out laughing in the dock at the ridiculousness of the entire situation. Frank’s early form was not convincing and he looked a tad unfit to begin with. However his match fitness improved and when Joe Miller arrived in November the last piece of the jigsaw was now in place. With Celtic now playing a brand of football the fans hadn’t witnessed for years the attacking triumvirate of McAvennie, Miller and Andy Walker was the focal point of their attack backed all the way by the sublime talents of Paul McStay. 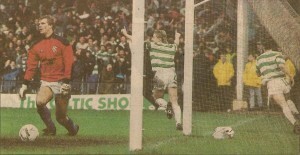 Frank was always at his best in the big games and he scored twice in the vital 2-0 New Year victory over Rangers. As the Celtic fans broke into a chorus of ‘Happy Birthday dear Celtic’ it was Frank who was the Celts’ hero with two fine goals, the first a shot from a Chris Morris’ cut back and the second a cracking looping header from a Morris free kick. The New Year celebrations were long and loud. 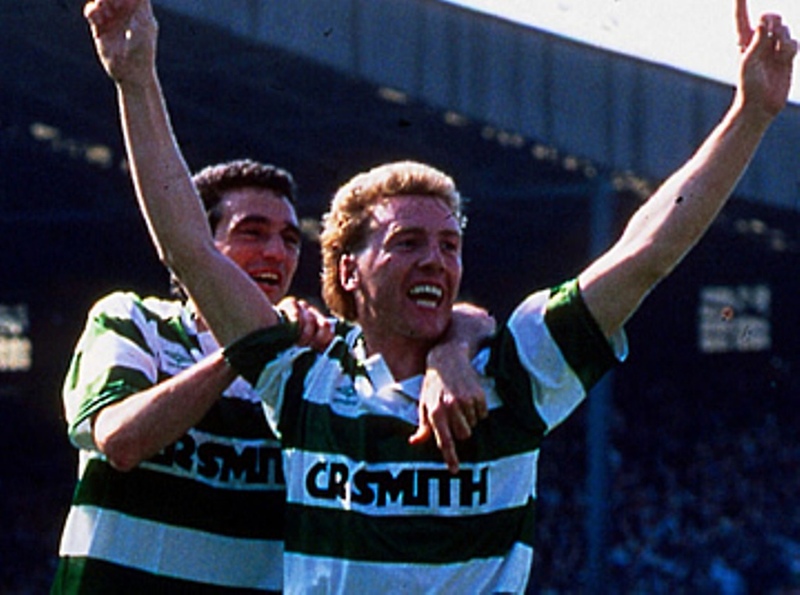 As 1988 wore on Celtic went from strength to strength with the partnership of McAvennie and Walker flourishing into the best strike partnership in Scotland. The league was clinched in April but Frank’s glory day was to come in the Scottish Cup final in May. 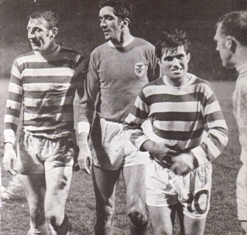 Against Dundee United Celtic were 1-0 down in the second half until Frank headed in an Anton Rogan cross and then with minutes remaining he grabbed the winner when he turned in a Billy Stark cross and Celtic had their first double in eleven years. The future looked rosy for Celtic but it was not to be. No serious investment was made in the squad that summer and any momentum gained was quickly lost to the big spenders at Ibrox. Rumours began to circulate that McAvennie was restless and that he was spending most of the weekends in London visiting night clubs with his ‘model’ girlfriend Jenny Blyth. He was arriving late for training on Monday mornings and running up a fortune in club fines. All was not well. In early 1989 matters came to a head when he asked for a transfer back south. 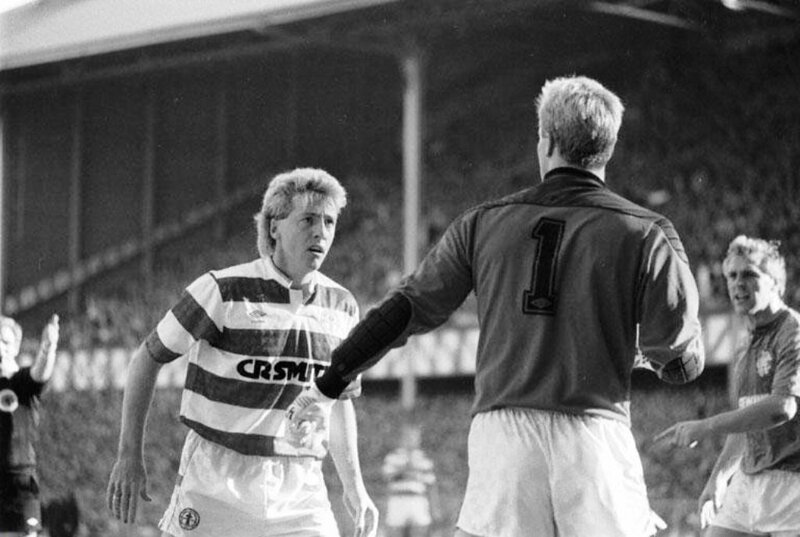 His last game in the hoops was a Scottish Cup tie against Hearts and the Jungle turned against their former hero and a chorus of boos could be heard every time McAvennie touched the ball. Despite the heated tempers Celtic won 2-1 and Frank was back off to Upton Park for another record fee £1.25M. 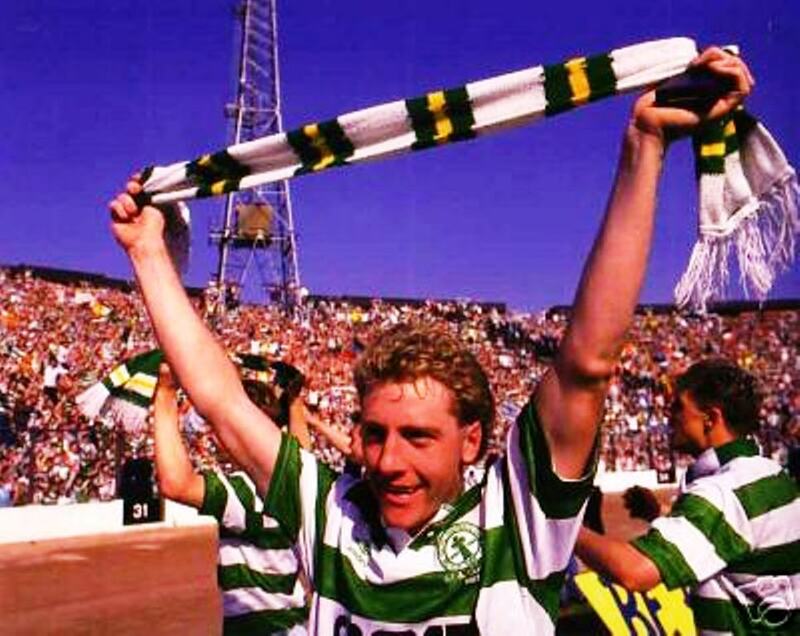 McAvennie was a genuine died in the wool Celt and had spent many years following the team all over Scotland. He had came into the game as a professional fairly late on and it’s maybe because of this that he obviously looked upon the fact that he could make more money in London as well as enjoy the night life and the glamorous females who came with it. And apparently there were plenty of them. In recent years Frank has tried to make out that he was dragged from Parkhead kicking and screaming. That’s not my recollection of the situation and when you add that the notorious Bill McMurdo was Frank’s agent then Celtic and Frank McAvennie were never going to have a long and happy existence together. He did return to Parkhead to a desperate Liam Brady in 1993 but injuries and age had taken their toll. When his old West Ham nemesis Lou Macari turned up as Celtic manager in late 1993 then it was all over for the Frankie Bhoy. 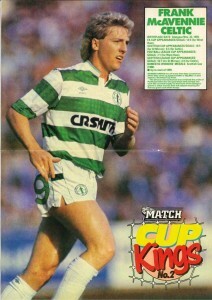 The second spell shouldn’t diminish the memory of McAvennie in the hoops during his original foray at Parkhead. He truly was the perfect centre forward. He was quick, strong, good in the air, a great finisher and had a physical presence which meant that no defenders would take liberties with him. And he had that other trait native to Glaswegians. He was ‘gallus’. He feared no one and this came across on the field and gave his team mates confidence not only in him but in themselves also. Without McAvennie it has to be said that Miller and Walker never reached the same heights again without him. In later years it has to be said that Frank was to have some unfortunate personal problems but he still comes across in the media as a likeable guy. In Celtic’s centenary season Frank McAvennie certainly left his mark and when future Celtic histories are written the name Frank McAvennie will figure prominently. Cross Border League? Do Fans Even Want One?